As it's only a couple of weeks before heading off to America, Pete and I have been up to a few random things - some fillers, some projects and some general trad climbing. At the moment, Pete is over in Ireland in the Mourne Mountains. No doubt, he'll be smearing his way up some desperate slabs somewhere in the mist. I spoke to him on the phone yesterday and it sounded like he'd already had "an emotional experience" on an E4 sandbag. Must be all that offwidthing that's wrecked your footwork Pete! Photo: Pete most definitely not working on his footwork! The previous week I headed over with my wife and daughter, to South Wales to have another look at a couple of cracks. 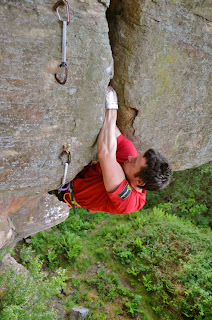 Last year I spent a day trying a roof crack project at Dinas Rock, which splits a pretty sizeable roof on finger-locks. Simon Rawlinson had very kindly done some of the cleaning for me, but it was really to no avail as I was out of shape and the jams were just hideously painful. This year however, I vowed to return in slightly better form and to be a bit more careful how I treated my fingers. I was really pleased this time to get all the moves on the crux crack sequence done, but still quite way from linking sections or large sequences together. I think it'll end up being around V11 for the roof crack and a tricky 20ft section to get there. Something to come back to in the future! On the second day we braved a bushwacking walk-in with a pushchair (Hannah and wife were not amused!) to go and repeat a really unique looking roof crack on sandstone. The Clart Mountain Project was established by a mate of mine (Si Rawlinson) after it was donated to him by a local bolter and activist. Whilst it did seem unusual to have bolted the line, I can't really say I blamed them considering that every other route in the entire quarry was bolted. All in all, a great little crack and would be around 7b or E6 6b on trad gear. Photo: Simon on the 1st ascent of the Clart Moutain Project. The last "H" in this blog will be Hannah, my daughter. It's been a huge challenge over the last few months trying to fit in family life, keep on top of my work and still train hard. The one thing that has kept me going though, when I'm totally knackered and feeling like I can't face yet another session in the cellar has been the little cheeky grin on Hannah's face. It's absolutely brilliant; like liquid-happiness. 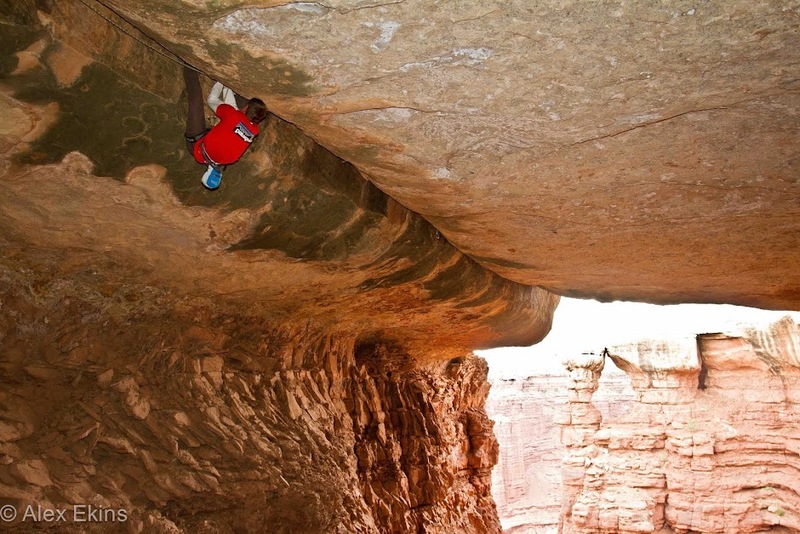 This blog is about two climbers who are searching out the widest, dirtiest and hardest offwidths that this planet has to offer. The journeys, the training, the routes and the failures - no holds barred. It's not about the grade, it's about the experience and when it comes to The Wide the experience is the same for everyone!